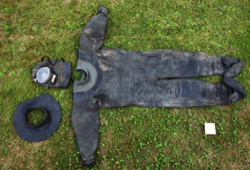 WANTED: Surplus- Vintage- Obsolete- Antique- Old- DIVING EQUIPMENT. Also Diving Books and Other Documentation. 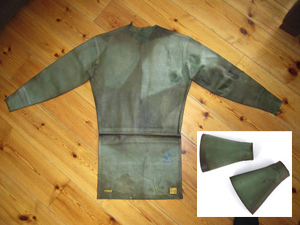 For sale: Draeger rubber dry suit hood which can be connected to a dry suit with a clamp and ring (clamp and ring are not included but are available as well: see the next advert) These rubber hoods were sealed in special envelopes in the nineteen sixties by the german army and come out 50 years later in mint condition(!) 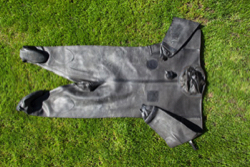 The black rubber is in good shape, the only parts that show wear are 2 small foam rubber discs inside the hood where the divers ears are: these discs need to be replaced. 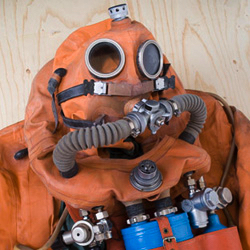 The suit and FF mask shown at the pictures below are not included The hoods are shipped in their german army package and are complete with the speaker unit. The speaker unit can be used with the Draeger T5520 communication sets offered here above. 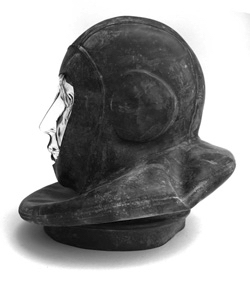 The Price per hood w. speaker 65 euro plus shipping. 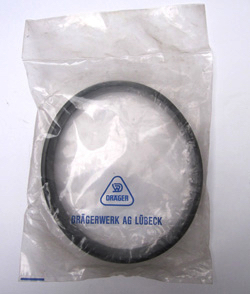 Price per hood without a speaker is 50 euro plus shipping, but when sold without the speaker the hole of it has to be patched (car tire patch) before use. To contact me click the ‘email me’ button at the bottom of this page. 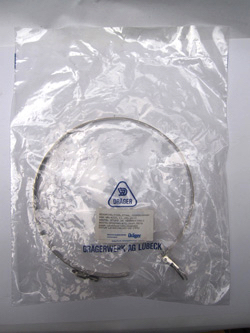 For sale: Draeger set of a neck ring with stainless steel clamp ring to connect a hood to a dry suit neck seal. Both items are in new (unused) condition. 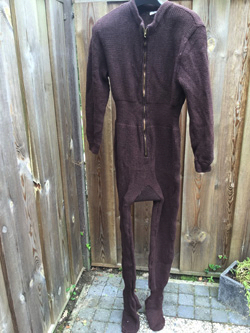 Price 50 euro plus shipping. 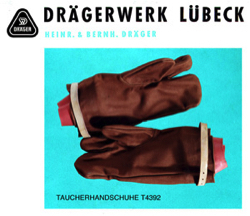 For sale: a pair of divers gloves by Draegerwerk Lübeck. 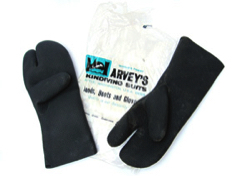 These gloves are military surplus, all are sealed inn, most are unused, some are used but ‘as new’. 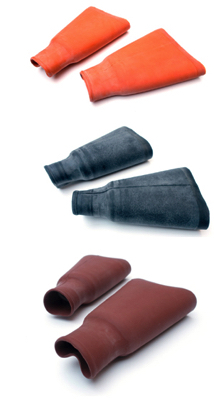 Price per pair 35 euro plus shipping. 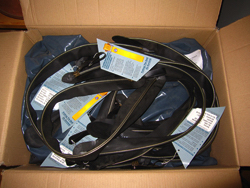 WE NOW HAVE SEVERAL OF THESE SETS AVAILABLE: 5 REBREATHERS AND 7 SUITS, SOME AS NEW, SOME USED CONDITION. THE FIRST BUYER CAN CHOOSE THE SET HE PREFERS. 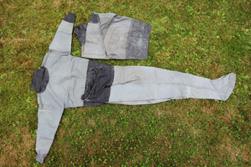 An old but hardly used drysuit model KV (Konstant Volume) 168. 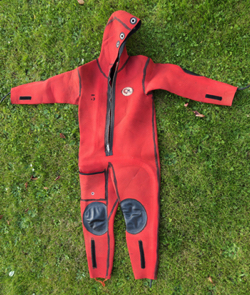 This suit came inn with a lot of gear from Germany last month. The rubber of the neck-entrance is 'gone' / needs to be replaced. 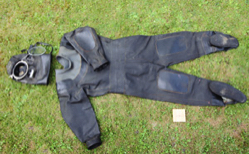 The black rubber needs cleaning but is in fine condition, see photographs. 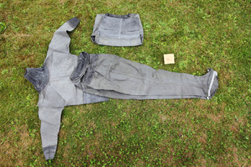 The suit is large: from the sole of the shoe to the upper end of the entry is 200 cm. 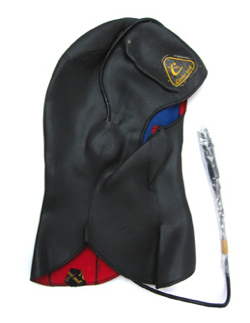 Price: €325,- plus shipping. We also have the KV 168 FFM with hood available, photo's and price on request. 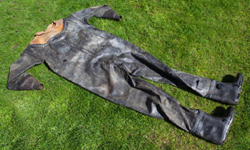 Genuine old Siebe Gorman 12 bolt suit. 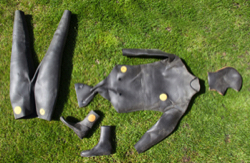 The suit is not in a dive able condition: the rubber got stiff. 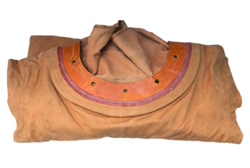 Still a very nice addition to a collection of antique diving equipment. 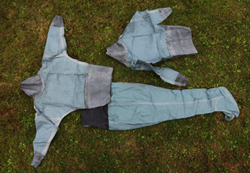 Used for deep diving: the Comex Warm-Water-Suit. 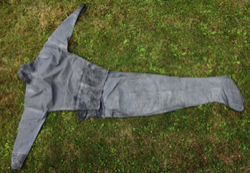 Sizes: Top of hood to end of leg (over all lenght) 167 cm. Waist 53 cm. Armpit to end of sleeve 51 cm. 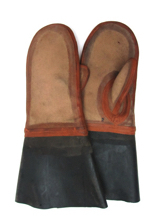 Old Style Cuffs for the Standard Diving Suit. New condition. 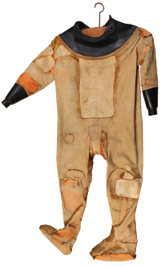 Available in Orange, Black and Brown. 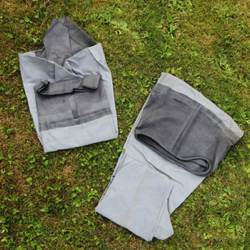 Sizes: the cuffs are about 24 cm long and 'flat on the floor' 16,5 cm wide. 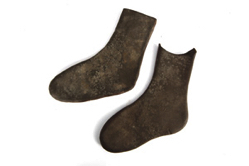 Price €25,- per Pair plus shipping.